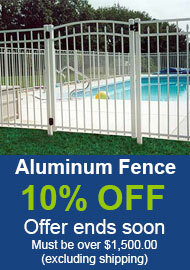 Select either 2" or 2 1/2" square aluminum posts. Most residential customers choose 2" square posts. For close up pictures of wall thicknesses - click here. This is what the majority of customers choose when ordering residential grade fence. Blank Posts: Depends on what they are being used for. Most customers order the posts 2 feet longer than the height of the fence. You may want to consider installing the post 3 feet in the ground depending on the soil conditions. If you have flush bottom sections please call to order. This is for standard aluminum sections.